Fatalities and multiple injuries have been reported following what Indonesian police say are two apparent suicide blasts at Kampung Melayu bus station in eastern Jakarta. Police say that two people have been confirmed dead, including the suicide bomber, Reuters reports. A senior official said that the attacker specifically targeted a police checkpoint located outside the station terminal, which mostly serves as a hub for vans and small buses. Elshinta Radio reported that the explosions occurred five to 10 minutes apart in a crowded area, causing extensive damage. Photos from the scene appear to show dismembered limbs and a severed head. “Everyone panicked and ran – the explosion was very loud, and then there was a strong smell,” an eyewitness told detik.com. Four civilians and four attackers were killed in multiple suicide bombings in central Jakarta in January 2016.Islamic State (IS, formerly ISIS/ISIL) claimed responsibility. 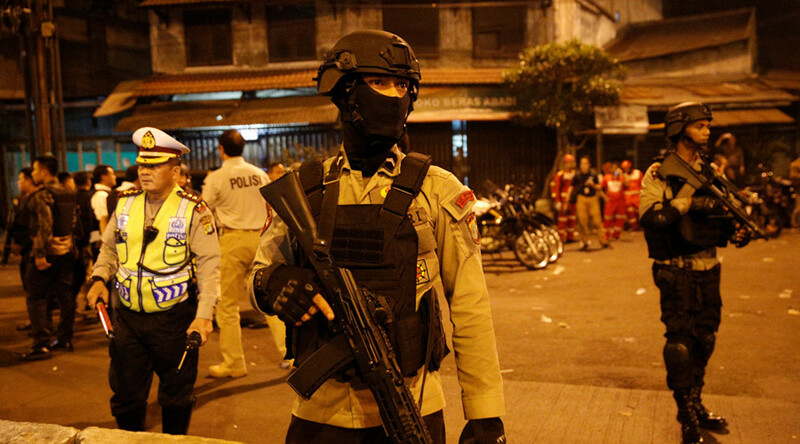 Indonesian authorities say that around 400 citizens of the world’s most populous Muslim state traveled to Syria and Iraq to join jihadist ranks, though outside estimates have given bigger numbers. Many have come back as Islamic State has been pushed back, and the government says that it is currently monitoring dozens of returnee radicals. Nearly 90 percent of Indonesia’s population is Sunni Muslim, but religious tensions have been running high in the capital, after the Christian governor of the city, Basuki Tjahaja Purnama, was replaced and sentenced to two years in prison for comments he made about the Koran.